Modifying a stock home plan can provide you the customization you want to meet your design goals. In some cases, a stock home plan must be modified to compensate for the building lot, building department, or Home Owner Association requirements. With the StartBuild Modification Services you can change your home to make it exactly how you want it. StartBuild will provide you with a free home plan modification quote for desired home plan changes. 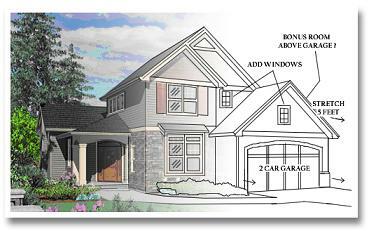 You can consult and work directly with one of our professional home plan designers about your home plan changes. StartBuild will provide you with a complete and affordable quote for your plan modifications. We can also provide an updated construction cost to build estimates for your modified home plan. Detail your plan changes in sketch and with notes, then email them to us. We will reply with a quote and consult with you as needed.